If you are like me, when you are looking for a gluten free recipe, you return to the same book again and again. Since diagnosis four years ago, I have been given a number of GF cookery books – some better than others! 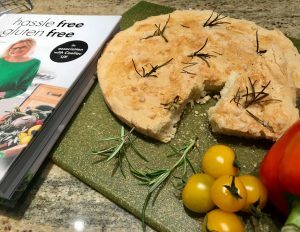 This new book: Hassle Free, Gluten Free by Jane Devonshire, a MasterChef winner, could well become one of my favourites. Jane has a coeliac son, so alongside being a cook in her own right, she has also had to battle with the issues of growing up and feeding a whole household, not all of whom are coeliac. As the cook and the coeliac in my house, it is relatively straightforward – if they want food, this is what they get! Jane’s book has already inspired me to produce her focaccia bread. On the face of it, this is an odd recipe: you have to whip up egg whites and then beat the dough into the egg white. But it works! This bread came out of the oven and the whole family declared it to be both “normal” and delicious. In the book Jane says you can add other flavours to it such as tomatoes, herbs and garlic. I put rosemary and seasalt on mine and have plenty of plans for more. What a revelation. There are not just cakes and bread in the book, she also has good pizza bases, pies, soups and things like fishcakes. Worth checking out.